“World Grand Prix Big-8 Muay Thai” is a world professional Muay Thai championship. Big-8 is only one tournament where fighters present whole continents! Fighter who win pyramid tournament (3 fights in 1 day) becomes a “King of Muay Thai”. Big-8 is the battle of continents, battle of champions! «Big-8 were held under the direction of the company in 2009, 2010 and 2011 in Minsk. The tournament’s broadcasting is provided by Eurosport channel. Channel «Eurosport» has broadcasted «World Grand Prix Big-8 Muay Thai 2010″ four times in prime time and tournament of 2011- also four times in “Fight club” TV- program. WKN recognized BIG-8 as the best tournament in 2010 and 2011. Honorary tournament guest Ernesto Hoost called “BIG-8» one of the best tournaments that he has visited. Only top fighters (world or Continental champions) can participate in Big-8 Gala. “Kings of Muay Thai” company have big experience in organizing World Top Muay Thai and MMA tournaments. The tournaments are always broadcasted in TV-program “Fight club” on “Eurosport” channel. 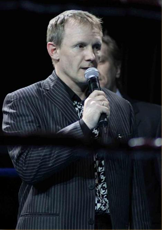 Eugene Dobrotvorski founder of «Kings of Muay Thai“ company & vice-president of WKN (World Kickboxing Network) organized many Worldwide Muay Thai and kickboxing Gala since 1999. New project World Grand Prix BIG-8 start in 2009 with big success and became traditional and are hold annually.